Cook ecoLife® White Basmati Rice, ecoLife® Red Quinoa, and ecoLife® Red Lentils in 4 cups of water for 15 minutes. Once the rice is done, set aside to rest for 5 minutes. Keep covered. Sauté poblano peppers in hot oil. After peppers begin to blister, add corn and tomatoes. 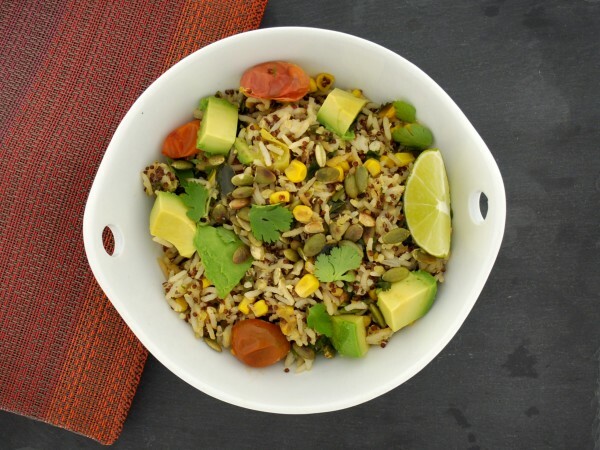 Mix cooked rice and grains with sautéed vegetable in a large bowl. Add avocado, cilantro, and as much of the lime juice.